Remember that slow cooked sweet potato chili? bake this yellow number to go alongside it. Salty and sweet. Nooked, crannied, and unabashedly crumbly. Buttery all on its own, but trust me, it’s even lovelier drizzled with a little honey. Preheat the oven to 400 degrees F. Whisk cornmeal, flour, sugar, baking powder, baking soda, and salt together in a large bowl. In a small bowl, whisk the butter, eggs, and buttermilk until well blended. Pour this mixture into dry ingredients and gently stir until just combined. Generously grease an 8” baking pan. Pour batter into prepared pan and bake for 22-25 minutes, or until a toothpick inserted in the center of the bread comes out clean. On a different note, I’ve read before that you don’t exercise, but walk a lot. This is what I do, but I can’t stop feeling guilty for not exercising. You see, exercise brings back a lot of bad memories from my days of ED when it would be used as a punishment and I honestly can’t say that I could go back to it without it making me feel like I was punishing myself. I do, however, walk loads (I’m at university and my campus is spread throughout the city s we walk everywhere) and take hikes and do other fun things that are active. But I still feel guilty… especially when ALL my friends exercise. And everyone in blog world exercises. And maybe I should too? Idk, how do you deal with this? Deep down I guess I know it should be enough, I just sometimes start doubting myself because everyone seems to think exercising is necessary to stay balanced and in health… and even people I talk to who DONT exercise always complain about how they should. But I guess everyone has different ways of balancing their lives- At the moment, as I said, I do walk absolutely everywhere, I mean I can’t even remember the last time I was in a car/taxi bus/train etc. Cornbread is my absolute favorite go with anything dish! You’re right it would be perfect with your chili. I’ll have to try this; I am always on a quest for the best cornbread. Right now the household favorite is Dorie Greenspan’s corn muffins. They include a cup of corn kernels in the batter and it gives a nice texture to the bread. I highly recommend it! 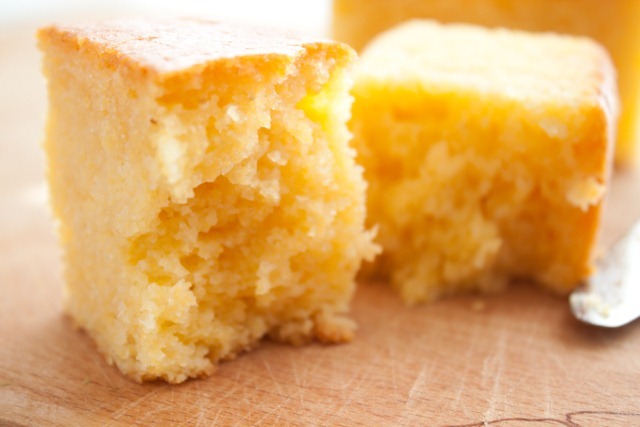 The texture of your cornbread looks absolutely perfect. I’m going to have to try your recipe as cornbread is one of my favorite things in the world, but I have yet to perfect it. I like the sound of “tried and true”. cornbread and honey butter – doesn’t get any better than that! Beautiful! I can’t believe I waited about 20 years of my life to have my first cornbread experienced. It didn’t look nearly as nice as yours, but I still loved it. And with that chili… match made in heaven! 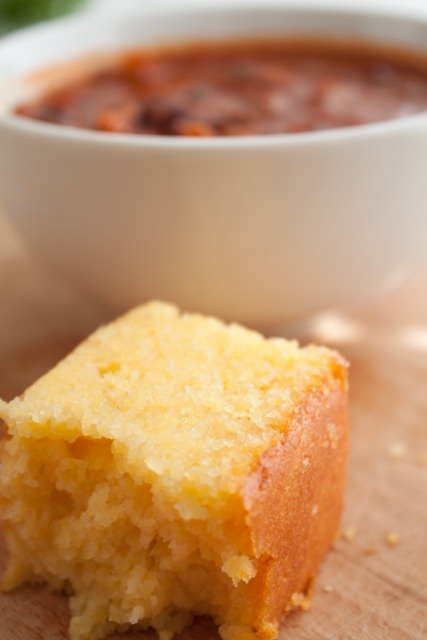 I love cornbread, especially with chili. This version looks delicious! If that is as moist and dense as it looks it’s the perfect cornbread for me! Okay seriously, this is the 6th time in 2 weeks I’ve thought I something I want to make and a blogger posts a recipe for it! I literally have cornmeal beside me on the couch! Is there a hidden camera in here!?! Looks so good! I have been looking for a good cornbread recipe! 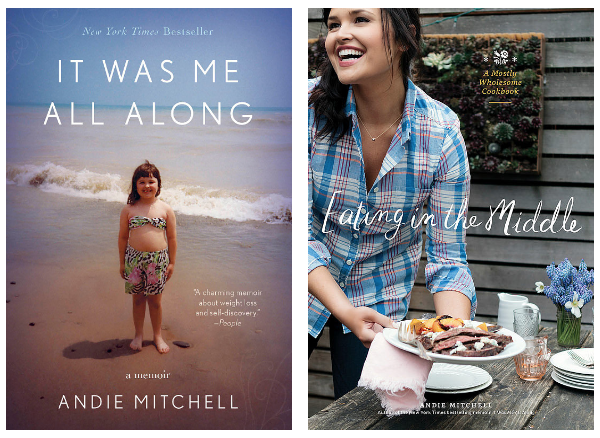 Im so glad you posted this – I’ve been trying a bunch of cornbread recipes and Im still looking for the perfect one. This is incredibly helpful because last time I made cornbread, my boyfriend said he was afraid he’d crack a tooth on it. This one looks like it might meet his standards. I’ll try it out with some chili. I was hoping you would post this recipe after the chili. :) It looks so freakin’ good. Come to Chicago and feed it to me? 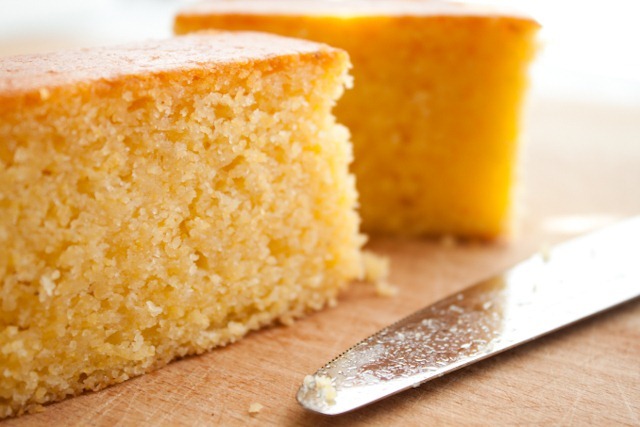 The crumb in your corn bread looks just perfect. Can’t wait to try it! In some weird fate-like way I saw this recipe, loved it AND had all the ingredients on hand ( this never happens). I made this last night and it was perfect. Not like “Mmmmm this is really good” but like ” oh my gosh, get in my mouth now”. Having a slice with honey and a cuppa tea this morning. Thank you for the great post! I need this now! Please and thank you. ahhhh..looks like it will melt inmy mouth. 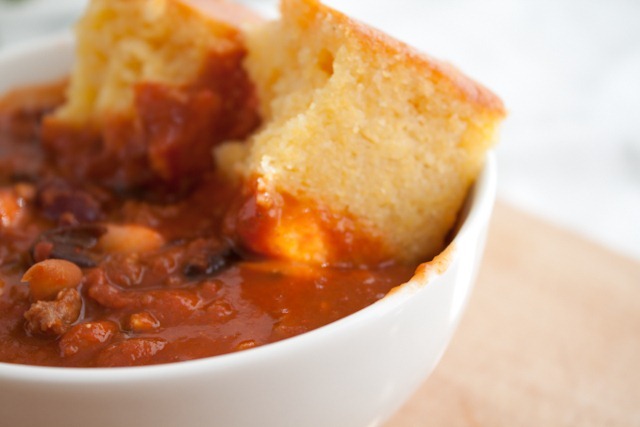 Chili and Corn Bread Sunday! I am literally making this cornbread RIGHT NOW. The oven is preheating and it’s waiting to go in. The sweet potato chili is in the crockpot bubbling away as I type this. Thanks for making my house smell absolutely divine on this gloomy, windy Saturday! I’m reporting back at your request, Andie. Both the cornbread and the sweet potato chili came out AWESOME. It made a ton of food, too. The sweet potato absorbed so much of the chili flavor that it didn’t stand out as much as I was hoping it would, but it was still insanely delicious and I will make this over and over again from here on out. The chili came out to be exactly 12 cups (which to me is a lot), which pleased me to no end because I am following Weight Watchers and made this easier to break down and record. For the record, 2 cups = 7 points. Not bad at all! And also for the record, I’m down 68.8 pounds. Booya! I’ve never made cornbread before (although I’ve eaten it plenty of times before) and this came out great. It was so easy, I couldn’t believe it. It was moist but still nice and crumbly. It was a fantastic dipper. I cut mine into 16 squares. 1 square = 3 pts. We are talking one super satisfying and low point meal here. Viva la chili and and cornbread! Andie this chili and cornbread was AMAZING! The smoked paprika and cumin were so good with the sweet potatoes. I can’t get my hands on buttermilk, should I try the milk and lemon juice substitute? Do you think it will come out the same? I did it with unsweetened plain soy milk and lemon because it was what I had on hand. It came out great! I will definitely give this a whirl. I’ve been searching for the perfect cornbread my entire married life! thanks so much for this excellent recipe. i made a gluten free/diary free version: i substituted the flour with almond flour and used 1 cup of homemade almond milk instead of buttermilk, and 1/3 cup of melted coconut oil instead of butter. baked it for 15 minutes and it came out perfectly! Great recipe. I would add one thing. Add a thin layer of oil to the cast iron pan. Put it in the oven while it heats. When it is hot, pour the batter into the pan. Then put it intro the oven to bake for the regular time. You will get the most delicious crust ever and the bread will be even better than before. I am trying this recipe tonight! Of course I had to make a few small changes since I’m cooking for a lot more people than the original recipe would feed but I can tell it will be great! This is the best cornbread I’ve made, turns out great everytime! Hi guys do we know the calorie content of this corn bread is? I just let you know about Pinterest. When I open up your site on my Kindle, I am directed to some game. I think someone has hacked into your website. Thank you for the recipe. It’s awesome and a hit at the dinner table. I can’t cook and you’re recipes are so easy to make. It’s awesome. But it will be our secret! WOW this cornbread recipe is delicious! I followed the directions exactly and it was just so tasty and smelled wonderful. My husband is a very happy man tonight. I made him chicken fried steak with mash potatoes, mixed veggies and this cornbread. Thanks so much for the recipe! I’ll definitely be making it again and again :).